Being billed by its new UK importer, Kedem Europe, as “Israel’s first ever premium winery,” 1848 Winery takes its name from the date it was founded by Yitzhak Galina-Shor, in a in a basement adjacent to the Western Wall in Jerusalem. Though the winery has moved and expanded more than once since then, the eighth generation of the Shor family is still involved in ownership and winemaking – whilst other Shor family members own a clutch of other wineries in Israel. 1848 is reputed to have been the pioneer of barrel ageing for wines in Israel, the first also to establish its own bottling line. Today a team of international winemakers and agronomists helps produce the wines, which are tiered in three ranges: ‘Reserve’, ‘2nd generation’ and ‘5th generation’. It appears that although eight generations of the original family have been involved in the business, the 2nd and 5th are celebrated specifically for their pioneering work that significantly developed the wine business. The vineyards are sited in Galilee and the Judean Hills, and grapes grown include Cabernet Sauvignon, Merlot, Petit Verdot, Shiraz, Petite Sirah, Malbec and Cabernet Franc for red wines, with Chardonnay, Chenin Blanc and Semillon for whites. 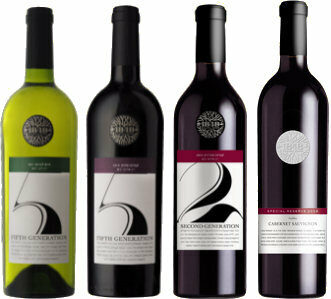 All of the wines are kosher and available from kosherwines.co.uk, but wine-searcher links are given for other stockists. These are very much ‘international wines’, blended from the world’s most familiar grapes like Cabernet Sauvignon, Merlot and Chardonnay, aged in French oak barrels, and made in a fairly extracted style verging on the ‘blockbuster’. On one level I find this a touch disappointing, wishing that wines with a 165-year heritage, made in a Mediterranean country, would show a little more character that was different from mainstream wines made across the globe. On the other hand, there is no doubt the wines are very good: they are well made, beautifully packaged, and they offer kosher wines of seriously high quality – and that is something that cannot be said for all of the Israeli kosher wines that I have tasted. I am not sure whether it is because the UK wine trade’s buyers are becoming more adventurous, or it is the consumer who is driving it. But the last couple of years has seen a mini boom in wines from Mediterranean countries hitting UK shelves with mainstream retailers like Marks & Spencer and specialists like The Wine Society stocking a whole range of wines from Lebanon, Turkey, Morocco and further afield. It’s great to see this diversity, though it will be disappointing if too many producers go after international styles using international grapes. 1848’s white blend is made up of 70% Chardonnay, 24% Chenin Blanc and 6% Semillon and weighs in with a chunky 14% abv. It has a pale golden colour, and a muted but inviting nose, a suggestion of nectarine and cool Asian pear, small honeysuckle and nutty notes, and a subtle but bright, mineral personality. On the palate it is poised and cool, very linear, with a tightness and precision defying its high-ish alcohol, a squirt of lemon and orange acidity playing against riper fruit notes and touch of creamy oak into a long, classy finish. 90/100. £21.50, see all stockists on wine-searcher. The least expensive wine of this tasting blends 57% Cabernet Sauvignon, 40% Merlot and 3% Petite Sirah. It spent 10 months in barrel and has a crimson/black colour, but less saturated than some in this portfolio with light on the rim. The nose suggests raspberry and dried cherries or raisins, the fruit bolstered by a touch of creamy oak. In the mouth that slightly stewed or dried quality to the fruit continues, with some spice and a little peppery note, good balance into the finish with modest tannins. 88/100. £17.50, see all stockists on wine-searcher. Lots of lift and fragrance to this boldly-coloured, crimson/black wine. Ageing here is in French and American oak barrels for 14 months, and there is 8% cabernet Sauvignon and 7% Petit Verdot in the blend. That soaring, kirsch and roasted mulberry and plum fragrance is attractive, a touch of cracked pepper and spice too. On the palate coffee is the overriding flavour, the mid palate showing lots of sweet, sweet fruit and a decent, tangy edge of acidity. The tannins are grainy and liquoricy, but it is that oaky toast, spice and vanilla that is just a touch too dominant for my taste. 89/100. £21.50, see all stockists on wine-searcher. Around 4,000 bottles of this blend are produced, the 61% Cabernet Sauvignon, 24% Merlot and 15% Petite Sirah aged 24 months in French oak. Bold crimson colour. Lovely nose: fragrant blackcurrant and juicy cherry, lots of smooth chocolaty richness and depth, a little touch of something minty or eucalyptus-like. Nice little cedary nuances too. In the mouth this has pleasing, savoury, medium weight and a touch of liquorice and plum skin edge to the tannins and acidity, nicely tart in the finish to offset the sweet fruit. 90-91/100. £34.00, see all stockists on wine-searcher. Pouring a bold, youthful crimson colour, the nose of this range-topping ‘flagship’ wine is lovely. It’s a blend of 63% Cabernet Sauvignon with 20% Merlot and 17% Petite Sirah, and the 28 months of French oak ageing has added a rounded, creamy rather than charry character, with some real pencil shaving and cedary finesse as well as quite bold red and black fruit. There is a hint of raspberry or cherry as well as the more expected cassis. On the palate the tannins are big, dry and powerful, really gripping this wine with dusty intensity, the oak adds another layer of vanilla, tobacco and spice, so there is depth and fullness. The fruit is nicely ripe, nicely sweet, but retains a pleasing edge of acidity. That gives the wine a bit of life and vitality, offsetting a rather overtly oaky and extracted character, that verges on being a touch too much for me. 91/100. £44.00, see all stockists on wine-searcher.